Strolling in a park is not a comfort in Japan because of people handing out flyers and tissues. Tissue advertising has become one of the most successful marketing medium when it comes to paper advertising. The outcome of this advertising mode is surprising for many reasons. The first reason would be because it’s cheap. Secondly, it’s a way of advertising by making people posses tissues, thus making them feel that free tissue and also advertising your brand at the same time. Originated in Japan, tissue advertising has found its way into the marketing medium and is growing rapidly because of its economical investment and proven outcomes. The sales of that company are known to increase exponentially because of tissue marketing. Now, this has sprawled into other parts of the world as well. In Singapore too, tissue advertising is establishing its foundation. This has led to creative minds working hard to innovate new designs and strategies to market their client’s product as much as possible within the space of the squared napkin. Various surveys conducted to find the best way of marketing a product has revealed that tissue advertising is also an efficient way of marketing a certain product. According to a survey conducted in internet, known as Marsh research has found that nearly as much as 76 percent of people accept free tissues. For any brand or a company it’s highly important to register their name in the minds of the consumers. With tissue advertising this seems to work because the possibility of people looking at the tissue is high and the whole idea of tissue marketing stands on this possibility. The people who hand out these tissues are mostly part time workers. This is the reason why they are in a hurry to hand out all the tissues. Many people get used to these tissues and it becomes a habit to these people and they would actually wait for these tissues. This can be used to increase the horizon of the company by advertising a new product of theirs. A tissue advertising strategy of handing out tissues from a restaurant with their menu printed on the cover. Innovation never ends. There is always a new and better form of everything. The success of tissue advertising also depends on this. Creativity should be focused and expressed on every corner of the tissue. This could take lot of time. So many companies would have many ideas already in place and at the right time they execute to reach out to the new generation of people. Singapore also has established the tissue form of advertising now. 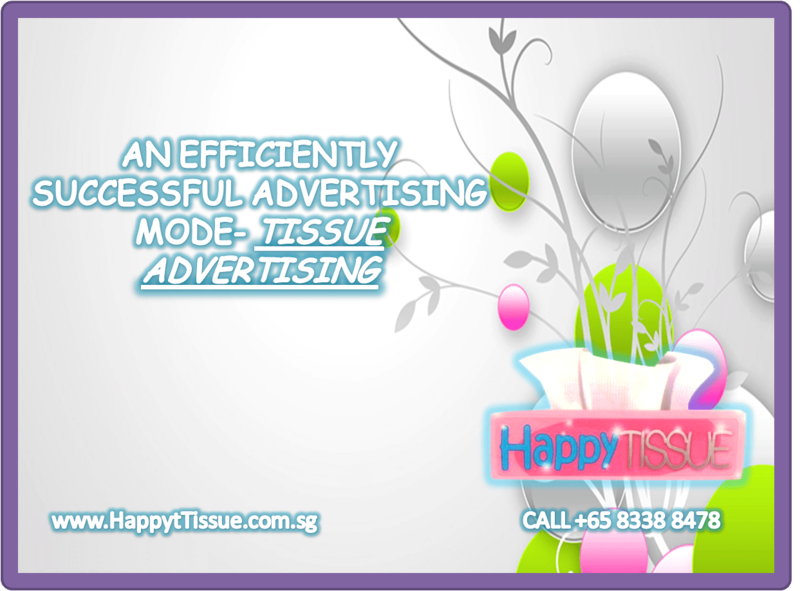 And when it comes to Singapore, Happy tissues are the leading company in tissue marketing. They have reached this level by extraordinary hard work, new innovations, implementation of many new ideas. The price too is reasonable.